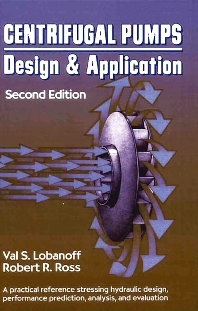 Centrifugal Pumps: Design and Application, Second Edition focuses on the design of chemical pumps, composite materials, manufacturing techniques employed in nonmetallic pump applications, mechanical seals, and hydraulic design. The publication first offers information on the elements of pump design, specific speed and modeling laws, and impeller design. Discussions focus on shape of head capacity curve, pump speed, viscosity, specific gravity, correction for impeller trim, model law, and design suggestions. The book then takes a look at general pump design, volute design, and design of multi-stage casing. The manuscript examines double-suction pumps and side-suction design, net positive suction head, and vertical pumps. Topics include configurations, design features, pump vibration, effect of viscosity, suction piping, high speed pumps, and side suction and suction nozzle layout. The publication also ponders on high speed pumps, double-case pumps, hydraulic power recovery turbines, and shaft design and axial thrust. The book is a valuable source of data for pump designers, students, and rotating equipment engineers. Elements of pump design. Introduction. Specific speed and modeling laws. Impeller design. General pump design. Volute design. Design of multi-stage casing. Double suction pumps and side suction design. NPSH. Applications. Vertical pumps. Pipeline, waterflood, and CO2 pumps. High speed pumps. Double case pumps. Slurry pumps. Hydraulic power recovery turbines. Chemical pumps. Mechanical design. Shaft design and axial thrust. Mechanical seals. Vibration and noise in pumps. Extending pump life. Alignment. Bearings. Seal reliability. Index.